Get your hands on this metal monster! From Steve Jones to Randy Rhoads, the Les Paul Custom has always been the hardest-rocking incarnation of Gibson's iconic single-cut model. Decked out with just the right amount of bling to make it desirable without becoming tasteless, the Custom has continued to be the 'one to have', just as Les wanted. 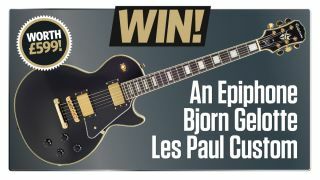 Most recently, Bjorn Gelotte of Godfathers of the Gothenburg death metal scene, In Flames has become the latest artist to create his own take on the Les Paul Custom, and we're giving one lucky reader the chance to win one!